Last week I was out with my girlfriends for dinner at an awesome Italian restaurant downtown. Dinner was absolutely delicious and we laughed until our tummies hurt – literally! As we walked back to the car, all four of us were complaining that we felt and looked 4 months pregnant, even though we didn’t overeat. One of my friends even said, “as soon as I get home, I’m mega dosing on digestive enzymes.” Can you relate to this? Why is it that bloating, gas, indigestion, and fatigue after a meal are so common these days? Do you think your body is trying to communicate with you through symptoms when you consume foods that it doesn’t digest well? You’re right — it is! How else can your body tell you that it doesn’t like what you’re eating? Headaches, breakouts, and digestive discomfort are simply little signals that your body is giving you to let you know that there is something else on the menu it would prefer to have. Food sensitivities (also referred to as intolerances) were not such a big issue 50 years ago. However, since then, we have increased our consumption of processed, packaged unhealthy foods. This hasn’t done us any good. These unnatural foods filled with chemicals work to suppress the immune system and create a toxic, unbalanced, inflamed gut. Once your system is inflamed, digesting foods is no longer an easy task. There is a lot of research showing a link between unhealthy digestion and the following conditions: inflammatory skin disorders (acne and eczema), chronic fatigue, IBS (irritable bowel syndrome), migraines, and weakened immunity. A stressed digestive system may also be the underlying cause of weight gain and/or difficulty losing weight. Could it be that you are regularly eating foods that your body simply doesn’t agree with? If so, isn’t it time you figure out what is bothering your system? Believe me, you can take all the digestive enzymes in the world, but you won’t feel any better until you remove the offending foods from your diet. Getting rid of your symptoms starts with removing all of your food culprits. It really is this simple. Now that you’ve made a decision to learn more about food sensitivities, speak to your Naturopathic Doctor (ND) about the different blood tests available. Keep in mind that there is a difference between food allergies and food sensitivities. For people who have severe full-blown allergies (e.g. peanuts or shellfish), they present with a Type I hypersensitivity reaction. Most people are aware of their Type I reactions because their body reacts violently immediately after being exposed to the allergen. Symptoms usually present themselves within minutes after eating the culprit and they’re usually quite severe – even life-threatening. This is different than Type III delayed reactions, also known as food sensitivities. These reactions cause symptoms hours or days after eating the offending foods and you present with more subtle symptoms, such as digestive discomfort, blemishes or fatigue. Chances are you will continue to struggle with the same physical complaints for years, unless you identify and temporarily remove foods that your body doesn’t digest well. Wouldn’t it be great to find out which foods you should be eating and which ones you should be avoiding? I’m sure your digestive system would appreciate a mini-vacation from offending foods. When you decide to get started, the quick finger prick test will cost you about $150. Your results can take up to 3 weeks to come in, but when they do, you will have valuable information to help you get rid of your symptoms. 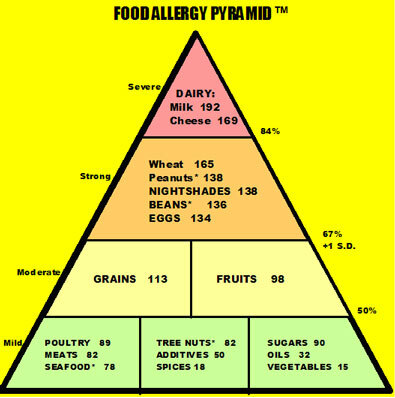 The standard food sensitivity test that I offer determines if you are reacting to dairy, eggs, gluten, wheat, soy, sugar, yeast + 3 foods of your personal choice. Knowing is better than not knowing, even if it means avoiding some of your favourite foods for a few months. In order to re-set your system, you must eliminate the reactive foods completely – usually for a period of 3 months – it isn’t forever. During the elimination period, I work with my patients to restore and repair their gut so that they can go back to eating the foods they love. I know that this process can be overwhelming so I encourage you to seek support from beginning to end. I always provide my patients with resources, grocery lists and food substitutes to make the whole process easier. Trust me, 3 months goes by really fast and you will enjoy your meals so much more.